Visiting the Garrison Brothers distillery in November gave me a true “central Texas” weather experience. By the time my trip ended, the weather was in the upper 40s and lower 50s. A few days earlier, during my visit to the distillery, it was 86 degrees. While some might balk at the wild variance in weather, I saw it as insight into an important part of the whiskey making process: interaction with wood. Cooler temperatures in Scotland allow for slower, gentler maturation compared to the typical bourbon aging climate in Kentucky. In Texas, every temperature swing has an effect on the whiskey’s interaction inside barrels. Garrison Brothers uses mostly 15 and 30 gallon barrels so there’s already a higher whiskey to wood surface ratio than most of the big players in Kentucky. The high temperature is just the cherry on top. It’s no wonder that their whiskey is already packed with flavor. The entrance to Garrison Brothers. I arrived at the distillery on a blistering afternoon and was greeted by Leah, one of only a few employees working near the vistors’ area of the distillery which included the gift shop. To cool off, she recommended some iced tea spiked with their small batch bourbon. It really hit the spot. From there, Kait Woodward, Garrison Brothers’ Hospitality Manager, took me to the operations side of the distillery. It was clearly a business under construction. I learned that over the previous 12 months, the distillery had doubled production not once, but twice. That’s huge growth for any company regardless of the industry. We started at the mashhouse. 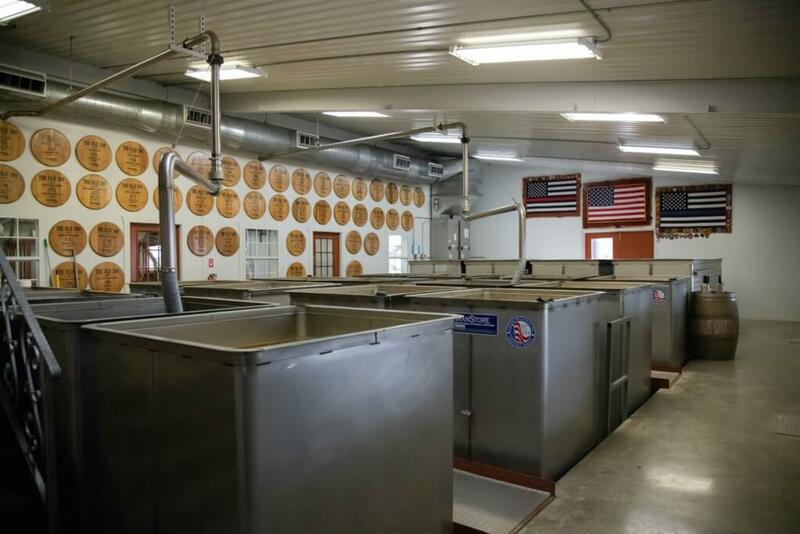 Garrison brothers uses the same mash bill for all their products: 74% corn, 15% wheat, and 11% malted barley. The mashhouse is also a museum of sorts. Along the walls are photos of bourbon legends like Elmer T. Lee and Dave Pickerell, both of whom were friends of the distillery. The walls also contain barrel heads honoring members of the Old 300, which was an early “ambassador association” program limited to (you guessed it) 300 members. The Old 300 were early supporters of the brand but as Kait told me, many of them became true friends of the distillery. Kait mentioned that some of the Old 300 even attended her wedding! The mash house at Garrison Brothers. Next, we checked out the stillhouse. At the time of my visit, they were in the midst of bringing a brand new larger still online. Among the various stills in the room was the Copper Cowgirl, once used by Elmer T. Lee as a test still. I noticed that every still in the room was made by Vendome. Most Garrison Brothers whisky ages in 15 and 30 gallon barrels (compared to a standard 53 gallon hogshead barrel) and there is no climate control whatsoever. There are even a small amount of barrels aging in small shipping containers across the property. 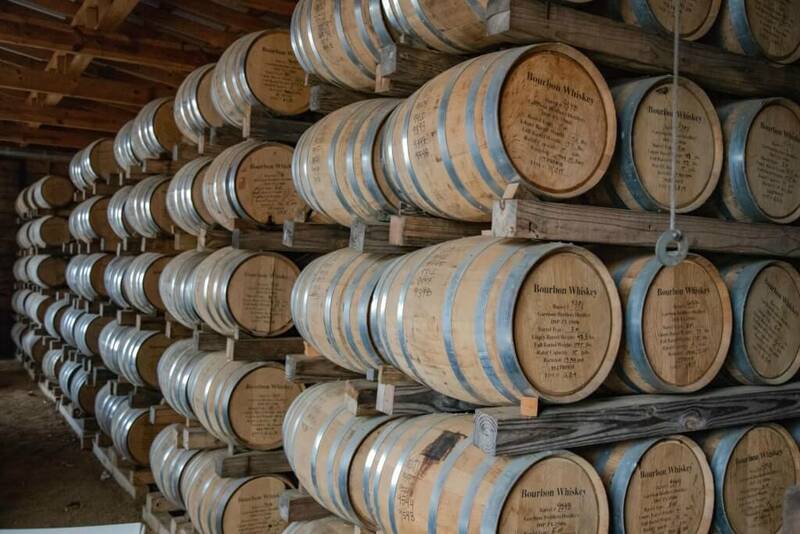 During the Texas summers, the wood interaction inside these barrels is incredible. During the tour, I saw an individual used barrel stave. The whisky almost made it through the entire stave in a single aging. Garrison Brothers takes an interesting approach to bottling and labeling. 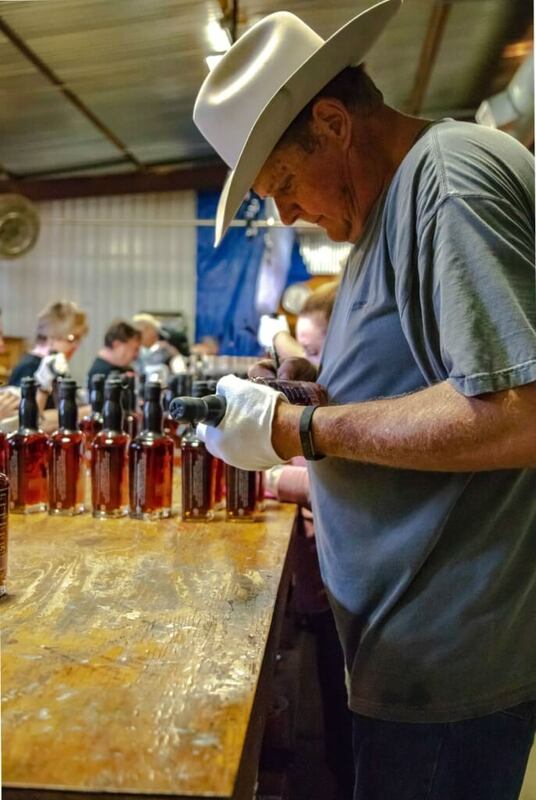 The final step of the process is done by volunteers who handle the wax dip stations and apply the final neck tags.. Every single bottle is hand signed by one of the distillers. Every single one. A Garrison Brothers distiller hand signing bottles. We finally made it over to Rickhouse “Numero Uno” where Master Distiller Donnis Todd was in the midst of a barrel pick with a client. They were nosing and tasting various samples when I arrived and Donnis was eager to speak with me so he left the barrel selection process for a few minutes (other staff members stayed behind) and we spoke outside the rickhouse in the hot Texas sun. As you’ll soon read, Donnis is passionate about distilling, bourbon, hard work, and attention to detail. The following interview is 99% unedited aside from a few words added for readability. Single Malt Savvy (SMS): How did you get started in distilling? Who were your biggest influences while you were learning that craft? Donnis Todd (DT): My grandfather, definitely, was the biggest influence and how I got started. My grandfather was a distiller and I grew up around the process. He had a tool and dye shop and even built stills. I got to see different designs so from a young age I had an opportunity to be around that. Then I spent 10 years in the Air Force and I always wanted to distill more and more so no matter where the Air Force sent me, I sought out distilleries and would do internships or work for free or just hang out until they made me leave. I had an opportunity to do that in Korea and Japan. SMS: Were there any foreign locations that really stood out while you were doing that? DT: Both of those did. In Korea, I learned a lot about fermentation, that you can almost ferment anything. In Japan, how precise and how, if you just take your time, you can literally do every single task perfectly. I think that I had takeaways from both locations. Then I got out of the service, moved here, and had heard that Dan and Charlie [Garrison] were in the process of starting a bourbon distillery and I sought Dan out and told him, “Hey man, I want to make bourbon for you.” At first, he said, “No, no, I don’t need any help.” and I just kept showing up like a bad penny. I just kept coming and coming and coming and eventually he got tired of saying “no”. I convinced him that he needed me. He probably didn’t but I convinced him that he did. The rest is history. SMS: There are so many options on liquor store shelves and in bars these days. Give me your 30 second elevator pitch on what makes Garrison Brothers’ whiskey different from the rest. DT: I believe, for a wheated bourbon, how big and bold and oily…the mouthfeel, you will get nowhere else. And you’ve gotta reach up to the top shelf but you’re doing that for a reason. It’s worth the reach. SMS: Similarly, from a whiskey making perspective, what’s unique about the process in Texas as compared to Kentucky or even Scotland? DT: I would say our climate, our weather. And that’s the same scenario in Scotland and Kentucky, they talk about their fourth seasons and their water. It’s our climate. It’s a unique environment here. SMS: Is there anything about the soil and local grains that you think really stands out? DT: We only use Texas grown corn and it’s a #1 food grain white corn. We have relationships with the farmers. I don’t know if that makes that corn better, but I do know that I have a passion to do good with that raw grain because I personally know the people and the sacrifices that they’ve made to grow it and harvest it and sell it. It just comes with some pre-loaded passion that goes right on through our product. I’m not saying that that actual kernel of corn may be better than one grown in Indiana or Ohio or Kentucky but I know the people who grow it and that gives me more fuel. A bottle of Small Batch inside the still house. SMS: Garrison Brothers has been selling bourbon for about 10 years. How have things changed during that time. Are consumers looking for something different today compared to a decade ago. Are you seeing demand for older whisky, higher proof, limited editions? DT: Over the span, I launched single barrel, [which] made a huge run. Single barrel was really what people wanted. It went from single barrel to cask strengths, which are really really hot. In between single barrel and cask strengths, rye made a big peak, then it didn’t, and then it came back, and then it didn’t. So rye has played a part in making single barrel taper off because rye spiked. I’ve never really tweaked the bourbon to try and follow that yo-yo. I focused on our small batch bourbon and every year and I was honest with people and said I’m making this better and better and this 2018 Small Batch is just phenomenal. And along the way of tasting all of these barrels over the last decade, I really started to find some single barrels that can stand alone and was proud enough to number and sign that bottle. Then we had an older inventory that was very high strength. Our Cowboy Bourbons are high 130s [proof]. People waited in lines for hours and we sold all of it in two hours. When you have that type of demand, of course you’re going to make some more of that. We’ve had the right barrels and maybe we were just lucky on the timing but launching single barrel was right around the time it was getting hot. And we already had an unbelievable cask strength for the market and then cask strengths came along. I did a double barrel which I called Balmorhea and I released it at cask strength. SMS: What’s the second maturation? DT: The one that’s aging right now is four years in a twenty-seven gallon Calvin cooperage that was twenty four month white American oak that was yard seasoned, and then a twenty minute toast and a fifty-three second char. So I let it stay in there four years and then I moved it to really special thirty gallon barrels I had made by the Barrel Mill up in Minnesota with another custom toasting and custom char on that second barrel. I’m going to let it go a full twelve months so that will be a five year old. The Balmorhea that just went out and won Micro Whiskey of the Year was a three and one: three years in one barrel and one in the next. The Balmorheas will usually be different. I’ll tell the story on the side panel, but it’s just fun to continue to push that envelope and try to make new expressions that people can enjoy. SMS: Is there one day in particular during your time here that stands out from the rest? What made it so memorable? DT: Definitely. It was December of 2008. Dan, Fred, and I dumped whiskey barrel no. 6 into a stainless tank and we all shoved our heads down in there, looked up at each other with a little disappointment, and we just went back to work. I was cooking mash on our 100-gallon mash cook and Fred was running the little “Copper Cowgirl” 100-gallon still and Dan was fielding calls. Not much was said. 20 or 30 minutes later, Dan said, “Come here! Come here!” and Fred and I walk over there. [Dan] was like, “Smell the tank!” We took a big old breath in and just lit up. Caramel and fig and chocolate and butterscotch. We all grabbed a glass and quickly, right then and there, learned a valuable lesson to let the bourbon open up…give it a minute. But the biggest thing we learned was that we had made a Texas wheated bourbon that Texans would be proud of. We took the notes, found that mash bill, found that barrel makeup (what oak, how long was it seasoned, what was the toast, what was the char), and we repeated that for 13,000 barrels here. So yeah, that was it. SMS: Where do you see the whiskey market in 10 years? How is Garrison Brothers forecasting for unknown changes in market demand? DT: Well, it would be awesome if we had a crystal ball but we do not. We have never even remotely come close to having enough bourbon so we continue to grow. Just this year alone, in March, we doubled production and here in mid-November, we’re going to double it again. So in less than a year, we’re four times bigger in terms of production. Now, those barrels are going to need four, five, six years. We’ll let the bourbon decide how long it needs just by tasting each barrel. We’re definitely looking six to ten years out that the market can handle us being four times bigger. We firmly believe that if we’re 100% honest and transparent and try to make the absolute best Texas wheated bourbon that can be made, I think we’ll be ok.
SMS: Are there any interesting experiments you’re working on that you can share with me? DT: Oh yeah, sure. We don’t have many secrets. I don’t talk a ton about the yeast but other than that, we’re all artists and this is an expression of who we are. You can take everything you saw here today, go back to Connecticut, and it’ll going to taste different because of your environment. We have nothing to hide. I just did a honey-infused bourbon. It was a ton of fun. People have loved it. Never in my life did I ever think I’d ever put anything in my bourbon other than pouring it into a glass and enjoying it but I[’ll] tell you what. I’ve had a lot of fun doing it and I’ve had so much enjoyment hearing stories about how much people enjoy it. I may do another honey bourbon someday but some stuff I have laid down…we have a rye that I could probably sell every bottle of it tomorrow. But I want to make the best Texas rye so I’m letting it go. Rye is spicy and it can handle this intense Texas heat and it can handle a little longer aging so I’m just letting it lay. I keep backing it up every year. So at some point Garrison Brothers is going to have…it’s still a bourbon. I used more than 51% corn, but it’s definitely a high rye mash bill and I’m excited about that one for sure. We’re going to give it all the time those barrels need. I took some four year old bourbon that I just loved and it can handle more oak and could have been a little sweeter so I dumped all of those barrels and put it in some French Oak Limosine barrels. Some of those huge barrels from France. Over $1,200 a piece for those. It’s been resting in there for a couple of years and the vanilla bean is starting to show up and that’s going to be a ton of fun in maybe 2020 or so when it’s hits the market someday. So we have a lot of cool stuff. We’ve got some old, different wine barrels, port barrels finishing bourbon. Lot of neat stuff. SMS: I’m always surprised actually that I don’t see more port finished bourbon because I think it’s, by far, the best finish. It adds this amazing nuttiness. DT: I think it gives it a great finish on bourbon, especially a wheated bourbon so we’ll be excited to put some more ports out. We called it Estacado, we’ve done a release before and people loved it. We used some port barrels from Llano Estacado winery up in Texas Tech. SMS: Those are all the questions specifically that I have for you. Is there anything else you’d like to add that hasn’t been discussed? 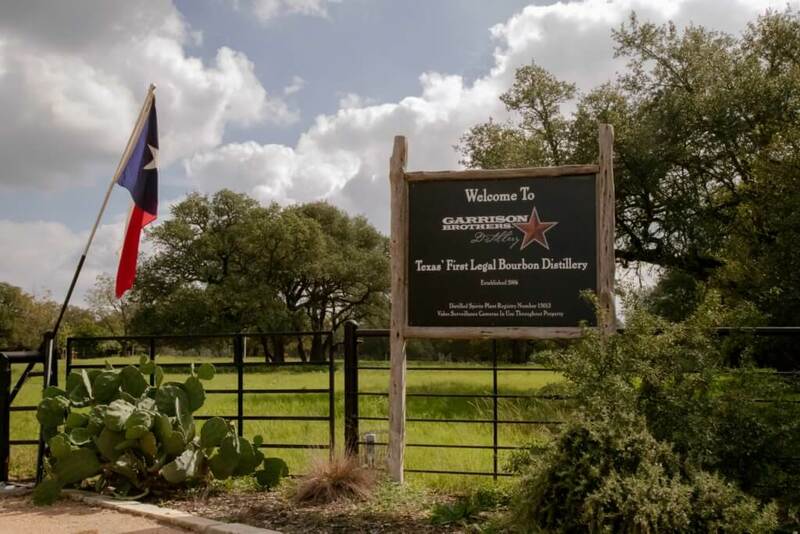 DT: I’m sure you’re 100% aware, but what I would want everybody to know is that every drop of Garrison Brothers is made right here on this ranch by hand and it means a ton to us that people know that. We build relationships with the farmers, we grow grain ourselves, mill it, cook it, ferment it, distill it, barrel it, age it, we bottle it and it just means a ton to us. It’s always important for someone who’s going to write or talk about Garrison Brothers to please relay that. It’s on the side of our bottle, that statement, and it means a lot to us. It’s so much more than liquid in a bottle to us. We believe it’s all about relationships and communicating and we truly believe that good bourbon can fix things and we’re gonna keep doing that. After our chat, I presented Donnis with a thank you gift: a Single Malt Savvy-branded Glencairn glass. I knew the distillery probably had more Glencairns than they knew what to do with. Still, his genuine appreciation of my small gift told me everything I needed to know about their culture. He invited me to stick around the rickhouse while they completed their private barrel selection. The client selecting the barrel was contemplating between different barrels and different strengths and Donnis did his best to steer them in the right direction, telling them which barrel he thought was better at barrel proof and which sample was better at 94 proof. In tasting one of the samples on the table, he immediately took the opportunity to use his new glass. Once the final choice was made, they signed the barrel and made it official. My visit ended with a trip back to the gift shop. I was already planning on grabbing a bottle of Estacado but Donnis generously arranged for the gift shop to give me with a bottle of their 2018 Small Batch as well. I truly appreciated the gesture. My takeaway from my visit to Garrison Brothers is one of a genuine, hard-working, passionate staff making an ever improving product. 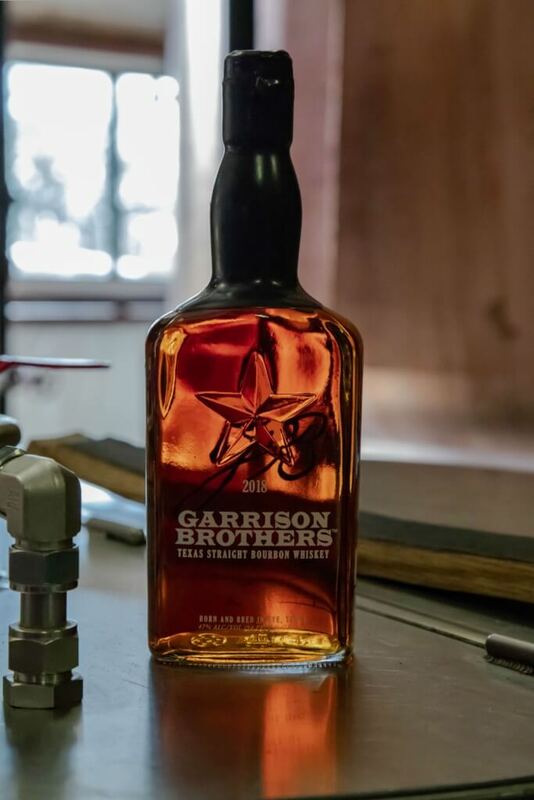 If you haven’t tried Garrison Brothers in a few years, you’re missing out on whiskey that truly gets better and better every year.